The first Canadian delivery of the Tesla was caught on video on May 11 at the automaker's Toronto Lawrence Avenue store. 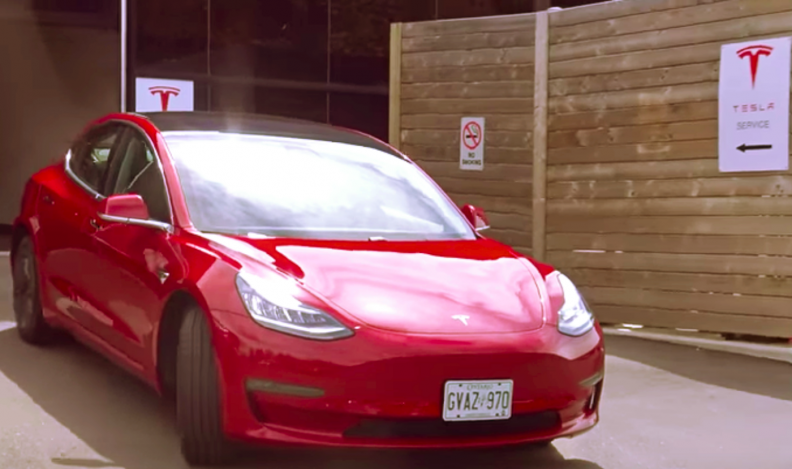 The first Canadian delivery of the long-awaited Tesla Model 3 has taken place, YouTube video and staff at a Toronto Tesla store confirm. You can watch video of the delivery at the end of this report. The electric-powered sedan, intended for the mass market but mired in production issues, was delivered to a customer at Tesla’s Toronto Lawrence Avenue store on May 11, staff there confirm. They weren’t authorized to say anything more and directed media enquiries to Tesla headquarters in California. Calls and emails to the automaker were not immediately returned. The Toronto Electric Vehicles Association called the delivery an “important historic moment” in Canadian transportation. A group called the Model 3 Owners Club, a collection of EV and, in particular, Tesla enthusiasts posted YouTube video of the delivery. Photos on the Model 3 Owners Club official Twitter account show the red and a black Model 3 in the Toronto store’s show room on the same day. “The first 2 Model 3s are going out today in Canada,” the post reads. On May 12, another red Model 3 was delivered to Evoto EV Car Rentals in Montreal. Days later, on May 14, the Model 3 Owners Club Twitter account shows nine more Model 3 sedans loaded onto an auto hauler outside the Tesla store in Oakville, Ont. Wording on the automaker’s Canadian website has been tweaked to reflect the progress being made. Pricing is now listed at $45,600 — before any provincial incentives in B.C., Ontario and Quebec — and a more concrete timetable for delivery is posted. Elon Musk, Tesla's billionaire founder, said in April the company was producing 2,000 Model 3 cars a week. Musk then told employees earlier this week it was "quite likely" the company would reach a rate of 500 Model 3s per day this week, or 3,500 a week, website Electrek reported on Tuesday, citing an internal email. But that same day, Reuters reported Tesla will pause production at its California factory for six days at the end of the May to work on fixes to its assembly line for its Model 3 sedan, according to sources inside the company. The Model 3 sedan, intended for volume production, is seen as crucial to Tesla's long-term profitability.